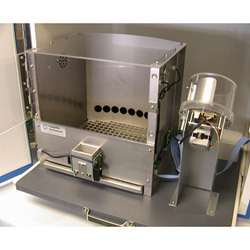 A complete 5/9 hole Rat Test Chamber that includes integrated ambulatory photobeams, white noise distraction and dimming functions along with a deluxe reward area, pellet dispenser, and sound attenuating chamber. This chamber may be connected to the ABET Control system via two 25 way cables. The complete 9 hole plus dimming and white noise configuration uses 16 inputs and 16 outputs from a single ABET Interface module. Alternative programmable configurations are possible to make I/O available for 5 hole, dimming, white noise and levers. All 9-Hole Test Chambers are shipped mounted to a slide out shelf that slides easily in and out of a durable light and sound attenuating cubicle for easy cleaning and maintenance. The core of the cubicle walls is a medium density composite selected for its excellent sound attenuating properties. The walls are first treated with an opaque anti mold fungicide and then coated with an acrylic protective finish to provide an impact and abrasion barrier, and to resist urine, water, alcohol, heat, or other staining. The cubicle includes a ventilation fan, external connectors for all power and control, and an observation optic. The task (the serial five choice reaction time task) is a test of sustained and selective attention, which has been well characterized in the rat to show clinical validity in a variety of settings, including attentional deficits in Alzheimer's disease patients. It is the first in what is expected to be a growing set of operant based tests in mice, allowing the exploitation of molecular genetics methods in unraveling the genetic contribution to complex psychological and behavioral processes.